Intense bouts of flooding are set to become more frequent, the Environment Agency has warned today (Friday 16 February). The warning follows a pattern of severe flooding over the past 10 years linked to an increase in extreme weather events as the country’s climate changes. Met Office records show that since 1910 there have been 17 record breaking rainfall months or seasons – with 9 of them since 2000. As intense storms are becoming more frequent, sea levels are also rising because of climate change. "Climate change is likely to mean more frequent and intense flooding. Floods destroy – lives, livelihoods, and property. "Our flood defences reduce the risk of flooding, and our flood warnings help keep communities safe when it threatens. But we can never entirely eliminate the risk of flooding. Checking your flood risk is the first step to protecting yourself, your loved ones and your home." The winter of 2013 to 2014 started with a coastal surge and record sea levels on the north and east coasts. 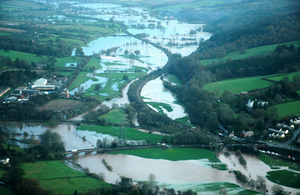 This was followed by 12 storms in succession and became the wettest winter for 250 years – 11,000 homes were flooded. The threat of flooding is real and increasing – as is also demonstrated by its listing as one of the nation’s major threats.